KMS Wunderskate™ plastic skatewheel ball bearing assemblies are used in skatewheel conveyor applications. They are designed to be maintenance free and operate without lubrication allowing them to be non-contaminating to the environment in which they are used while surviving the application challenges of humidity, condensation, wash down, underwater, and hot or cold environments. Plastic race skatewheel ball bearings improve the performance and life expectancy in harsh environments over conventional steel bearings while providing a substantial cost savings from reduced downtime. The KMS Wunderskate™ claim to fame is its “remarkable spin ability”. 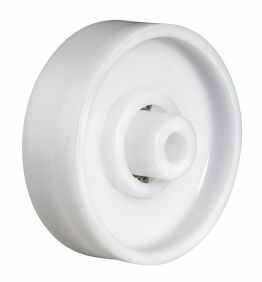 The Wunderskate™ outlasts all other plastic conveyor skate wheels in free spin. 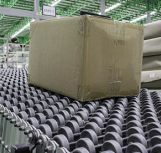 This enables skatewheel conveyors to move the lightest of boxes at low inclines simply by gravity. Critical Design features: Acetal (POM) or Polypropylene (PP) plastic races fitted with either 316 stainless or polymer balls. Features a single row True Race Technology™ ball groove construction for optimum load, and free spin capability. Rust Proof: Engineered polymers fitted with food & medical grade balls in either 316 stainless or polymer will not rust in wash down or refrigerated environments. 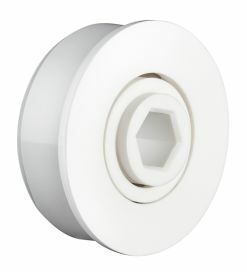 Weight Savings: A KMS plastic skate wheel ball bearing is 1/5 the weight of a steel skatewheel bearing thereby reducing the weight of your overall unit. Noise control: Engineered polymer races fitted with either 316 stainless or polymer balls naturally have less friction than metal to metal steel conveyor bearings. 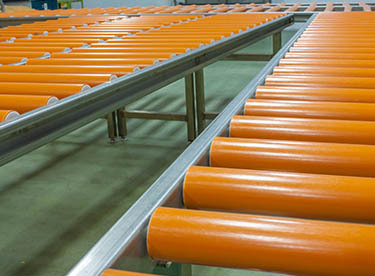 Plastic conveyor ball bearing assemblies are used in roller conveyor applications. They are designed to be maintenance free and operate without lubrication allowing them to be non-contaminating to the environment in which they are used while surviving the application challenges of humidity, condensation, wash down, underwater, and hot or cold environments. Plastic race conveyor bearings improve the performance and life expectancy in harsh environments over the conventional steel bearings while providing a substantial cost savings from reduced downtime. Critical Design features: Acetal (POM) or Polypropylene (PP) plastic races fitted with either 316 stainless or borosilicate glass balls. Features a single or double row True Race Technology™ ball groove construction for optimum load, and free spin capability. Rust Proof: Engineered polymers fitted with food & medical grade balls in either 316 stainless or borosilicate glass will not rust in wash down or refrigerated environments. Weight Savings: A KMS plastic conveyor ball bearing is 1/5 the weight of a steel bearing thereby reducing the weight of your overall unit. Noise control: Engineered polymer races fitted with either 316 stainless, borosilicate glass balls naturally have less friction than metal to metal steel conveyor bearings.